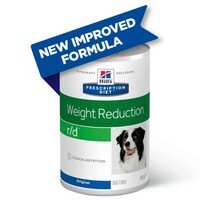 Hills Prescription Diet RD Weight Reduction Wet Food for Adult Dogs is a complete and balanced diet for the nutritional management of obese or overweight dogs with the aim to reduce body mass. Just a little bit of extra weight can affect the quality of your dog’s life, and by using Hills R/D you can help them metabolise fat, maintain lean muscle and provide them with all the nutrition they need as they lose weight. This food has been excellent for our fussy overweight dog. she loves the taste, it has helped her digestion because of the high fibre and she has lost 8lbs. love it.